If you are a fan of Nordic crime fiction and are limited to English as your reading language, then you already know that it will take even the most vociferous reader years, if not a lifetime, to catch up on the backlists of authors from that region. Anne Holt is one such writer; enormously popular in her native Norway, her work has been published here sporadically and parsimoniously. That is about to change, at least with respect to her Hanne Wilhelmsen series. "It’s a compelling and addicting narrative that’s very contemporary, even as it owes much to classic mystery novels..."
1222, the seventh installment, has just been published in the United States; the first, BLIND GODDESS, is excerpted in the book and will release here in June 2012. Please don’t wait six months to read 1222; so much (apparently) happens between books one and seven that there is no point. While the novels (again, apparently) tell a sequential story, the latest can stand quite ably on its own terms. It’s a compelling and addicting narrative that’s very contemporary, even as it owes much to classic mystery novels, a debt that Holt freely acknowledges at one point. Hanne Wilhelmsen is a complicated character --- not easily likable, by any means, particularly at first blush --- though readers will find themselves coming around to an admiration (at the very least) by story’s end. Wilhelmsen is a former police officer who, at some prior point in the series, sustained a gunshot injury in the line of duty that has left her a paraplegic. As 1222 opens, Wilhelmsen is travelling by train to consult an American medical specialist concerning some physical difficulties she’s been experiencing secondary to the injury. A violent snowstorm (a hurricane, if you will) causes the train to crash, stranding its occupants at a famous railway lodge. The lodge --- solidly built, well-staffed, and containing plenty of food --- appears to offer safe harbor, even as the passengers ponder the mystery of the occupants of the private rail car that was at the end of the train. Those poor souls were the first to be evacuated and have taken an isolated refuge on the hotel’s top floor. Speculation about their identities is soon superseded when a well-known clergyman who was also on the train is found murdered just outside the lodge. Wilhelmsen has no desire to become involved in what is clearly a matter for the police, once the travelers are rescued. When another clergyman is murdered, Wilhelmsen finds herself coaxed back into a familiar if not entirely comfortable role as she slowly but methodically begins ferreting out the murderer from among the stranded group of diverse travelers. Those whose familiarity with mystery novels cuts wide and deep will recognize any number of plot devices, but Holt takes things a step or two further in character development of the primary and secondary personalities who populate 1222, not the least of which, of course, is Wilhelmsen. As difficult as Wilhelmsen is, one can understand why. She basically wants to be left alone, even as the effects of her injury make her stand out. It is ultimately her intellect that brings her to the forefront of those stranded in a hillside blizzard, where Holt uses her creation not only to solve a mystery but also to explore political and cultural issues. While Wilhelmsen is not a warm and fuzzy character, she is not predictable either. The combination of these elements makes the book an engrossing and addictive reading experience. 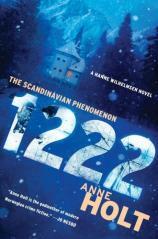 1222 was first published in Norway in 2007. Anne Holt has been writing another series since then, but by no means does it read like it’s the end of the road for Wilhelmsen. The lag of almost five years between the Nordic debut and its U.S. publication makes for some interesting occurrences, given that history, as they say, has moved ahead since 2007, thus rendering the very end of the novel somewhat otherworldly, though still startling. That aside, 1222 will cause you to add Anne Holt’s name to your ever-growing list of must-read authors.